Uber Technologies Inc. faces more than 30,000 taxi and limo drivers across Europe in the region’s biggest protest against the smartphone app that's threatening to upend the car-service industry. At least 3,000 Parisian drivers are planning to block the Charles de Gaulle and Orly airports as well as the A1 highway that circles the French capital starting at 6 a.m. local time. tomorrow. Similar demonstrations are planned in Madrid, Milan and Berlin. In London, between 10,000 and 12,000 black cabs and private hire cars are expected to descend on the tourist hubs of Trafalgar Square and Parliament Square at 2 p.m. While Europe’s taxi industry has in the past held local rallies against Uber, whose app allows customers to order a ride from drivers who don’t have taxi licenses, its unison underscores the challenges the San Francisco-based company is facing to justify a $17 billion valuation. The protests also mark an increasing backlash against the likes of room-booking service Airbnb Inc. and video-streaming provider Aereo Inc. as they clash with traditional industries arguing the competitors should be subject to the same regulations. In an e-mailed statement to Bloomberg, Uber said its teams in Europe plan to keep the city moving tomorrow. In London, posters calling on drivers to join the demonstrations mimic a World War I recruiting campaign, featuring military commander Horatio Kitchener and his characteristic handlebar mustache. Madrid drivers plan to strike for 24 hours starting at 6 a.m., with a demonstration scheduled outside the Public Works Ministry at 1 p.m. In Milan, some 5,000 taxis are expected to strike from 8:00 a.m. to 10 p.m. About 1,000 Berlin drivers are set to converge on the Kurfuerstendamm shopping street at noon. Uber raised $1.2 billion in new financing led by Fidelity Investments last week, valuing the company at about $17 billion, before added investments. The company had earlier raised $307.5 million from investors including Google Ventures, TPG Capital and Menlo Ventures. Led by Chief Executive Officer Travis Kalanick, Uber is expanding rapidly in European cities. After complaints by Paris cab drivers, France imposed a rule on private services, requiring a minimum 15-minute wait between the time a car is booked and the passenger is picked up. The decree was later struck down by the country’s constitutional court. A Berlin court has also banned the Uber Black chauffeur service in April, although the injunction hasn’t been enforced. Kroes’s office said yesterday digital innovation always causes disruptions and that it’s up to national governments to deal with these issues through dialog -- not bans. 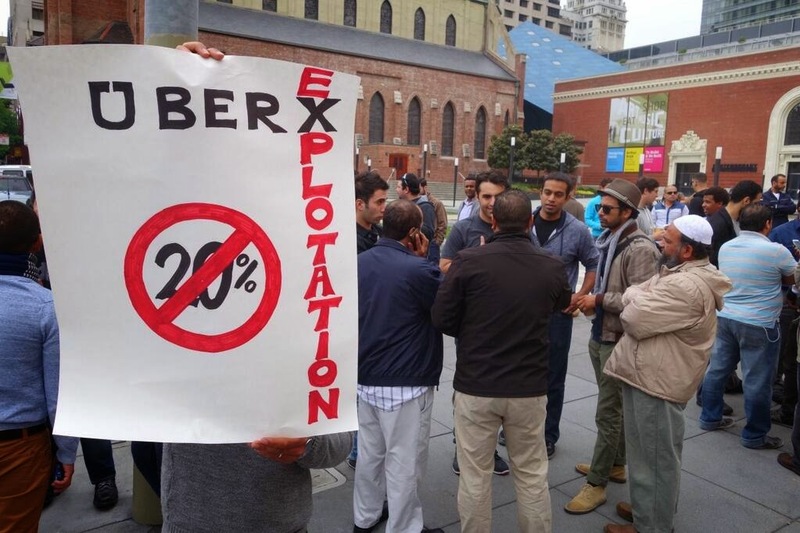 “We don’t see them as the enemy of taxi drivers,” said Ryan Heath, Kroes’s spokesman in Brussels. Uber advertises itself to prospective drivers as a way to start your own business, drawing users who aren’t professional chauffeurs. That’s different from apps such as Hailo, which recruit from the industry. Uber customers can tap the app on their smartphone and see the locations of taxis in real time, pay and tip via a stored credit card and rate their driver. Kalanick -- who started Uber in 2009 after he and partner Garrett Camp couldn’t find a cab in Paris -- has pushed the company into 128 cities in 37 countries. Last week, it started operations in Miami, Austin and Orlando as well as Lille, France, and Tijuana, Mexico. Kalanick said that he plans to lower prices to boost demand and the number of trips his drivers make each hour. The company said in its blog it’s responsible for 20,000 new jobs per month. The median income for drivers using the UberX platform, Uber’s low-cost service, is $90,000 per year in New York and more than $74,000 in San Francisco, the company said. Still, protests continue to grow against the app in Europe, some violent. Parisian protesters in January vandalized cars using Uber, slashing tires and breaking windshields and windows.